Man who threw boy from mall balcony was "looking for someone to kill"
TOKYO -- One of Japan's most active volcanos erupted spectacularly Friday evening with a fiery blast that sent lava rolling down its slope. 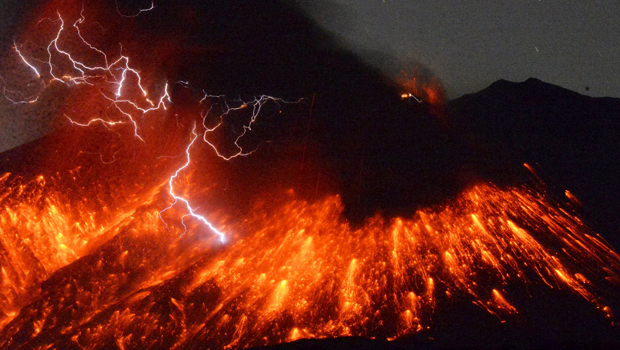 Japan's Meteorological Agency said Sakurajima on the southern island of Kyushu erupted at around 7 p.m.
Japanese television showed an orange burst out of the side of the volcano, near the summit, accompanied by lightning-like flashes. Dark gray smoke billowed into the sky. The Meteorological Agency banned entry to the area, expanding an existing no-go zone around the crater to a 1.2-mile radius, according to public broadcaster NHK. There were no immediate reports of injuries. Friday's eruption, while dramatic, was average compared to Sakurajima's past eruptions, Kyoto University volcanologist Kazuhiro Ishihara told NHK. The mountain's last major eruption was in September. He said rocks spewing out of the crater were expected to fall within the 1.2-mile zone from the crater. Smoke and ash rose 1.2 miles into the air, about half the height measured in 2013 in one of the mountain's biggest explosions in recent years, he said. "I don't think there will be any serious impact from the explosion," Ishihara said. "But of course we must keep monitoring the volcanic activity." The Japanese archipelago sits atop the Pacific "Ring of Fire," an arc of volcanoes and fault lines in the Pacific Basin, and has more than 100 volcanoes. The 2014 eruption of Mount Ontake in central Japan killed 57 people. A new Wired article reveals how Facebook navigated one of its most tumultuous periods. In the magazine's May cover story, "15 Months of Fresh Hell Inside Facebook," includes interviews with 65 current and former employees of the social media giant. Wired editor-in-chief and CBS News contributor Nicholas Thompson, who co-wrote the story, joins "CBS This Morning" to discuss the controversies. The article also explains why Instagram's co-founders left the company, six years after Facebook acquired the platform. Amazon is speaking out about Project Zero, the company's latest effort to crack down on counterfeit goods sold on their site. The online retail giant has more than 300 million active users. They spent more than $141 billion on products last year. Carter Evans spoke with Dharmesh Mehta, Amazon's vice president of customer trust and partner support. "Inside Edition's" Deborah Norville says she is grateful to the concerned fan who spotted a lump on her neck about 20 years ago. Two weeks ago, her surgeon removed most of her thyroid after nodules in her neck tested positive for cancer. On Monday, Norville was back on the air again. She joins "CBS This Morning" to discuss her experience and what people should do spot similar risks. It's Tax Day, but don't fret if you're not ready — asking for more time to file your return is a pretty straightforward process. Yahoo News reporter and producer Jeanie Ahn joins CBSN to explain how to get a tax return extension and how you can prepare now for next year's tax season. Notre Dame Cathedral was home to many priceless pieces of art and religious artifacts. Candida Moss, the Edward Cadbury Professor of Theology at Britain's Univeristy of Birmingham, joined CBSN with more on the meaning behind this iconic structure. Millions of dollars have already been pledged to restore the iconic Notre Dame Cathedral in Paris. Candida Moss, the Edward Cadbury Professor of Theology at Britain's University of Birmingham, joined CBSN AM with more on the significance of the site. Notre Dame Cathedral in Paris is still standing after a massive fire caused extensive damage yesterday. CBS News correspondent Elaine Cobbe joined CBSN from Paris with the latest.